As I discussed in Sleepers 1.0, everyone seems to have a different definition of a sleeper. In that version, I used the simplest I could think of: players who were being slept on by drafters according to their NFBC ADP. And barring injury I still believe in most of those guys. But I can also hear some exasperated sighs as I look at that list. Yes, those are big name players literally everyone already knows about. That's not your idea of a sleeper? Well, I've got some new criteria for you. Tyler O'Neill isn't just one of my favorite sleepers: He has a chance to be one of my favorite players. That's because he absolutely mashes. He hit 57 home runs in 195 games at Triple-A. He hit 32 as a 20-year-old in High-A. He already has four this spring. So why doesn't everyone love O'Neill? He probably doesn't have a job on Opening Day. It's ridiculous really, but Dexter Fowler is standing in his way. To be clear, Fowler shouldn't be standing in anyone's way after last year. He hit .180 with a .298 slugging percentage and was a negative on defense as well. He was "worth" -1.5 fWAR. He hasn't been any better this spring, starting 5-for-27 with eight strikeouts, one walk and one extra base hit. While O'Neill won't likely start the year as an every day player, it can't be too long before the Cardinals accept the fact that Fowler is no longer a Major League player, no matter how much money they owe him. An injury will delay Jesus Luzardo's major-league debut, but it's coming. It's hard to imagine how the Athletics could refuse him. Luzardo came into spring training as arguably the best left-handed pitching prospect in baseball, and he's done nothing to cause anyone to doubt that on the mound. In 9.2 innings he's struck out 15 hitters, and allowed just 10 baserunners and one earned run. This is the same kid who had a 2.88 ERA with 129 Ks in 109.1 innings across three levels in 2018. Maybe the Athletics want to see a little more from Luzardo in Triple-A after he's healthy, but every time he took the mound in the spring he made the decision a little bit harder for them. He's shut down for the first five or so weeks of the regular season, but there's still a chance we see him before June. Whenever he makes it to the major leagues I expect him to be a top-40 starting pitcher with top-20 upside. An innings limit will keep him from being that over the full season, but he should still be able to get to 150 innings in 2019. And this delay to his start may make it so he will be available all the way through the end. This is quickly turning into a group of players who may miss April. Gregory Polanco is still recovering from offseason shoulder surgery. It's just that his consensus ranking doesn't seem to recognize how far along he is. He was already "swinging without reservation" in February and there's some thought he may be able to DH in a spring training game. Even if Polanco didn't return until mid-June as was expected, I'd be interested at his ADP in any league with a DL slot. If he returns in early-May? He's an absolute steal. There's been plenty of upside cast onto Polanco that he hasn't quite lived up to, but all you need for a profit is for him to be who he's been. Whether it's the guy who stole 27 bases in 2015 or the guy who hit 23 home runs in 130 games in 2018. You're likely getting a little bit of power, a little bit of speed and plenty of run production near the top of the order. The best part? You may be getting it a lot earlier than we previously thought. Luke Weaver lost a lot of his luster in a miserable 2018 with the Cardinals, but he's trying to do something about it. He went out and bought a Rapsodo machine in the offseason to work on his curveball and he's planning on using his cutter more. His new team has had success getting bounceback seasons out of pitchers like Patrick Corbin, Robbie Ray and Zack Godley in the past and Weaver has the pedigree and the stuff to give you reason to believe. Best of all, he's almost free with an ADP below his consensus ranking. The Braves are loaded with arms, so someone had to make this list. With Mike Soroka and Luiz Gohara already ruled out, Touki Toussaint looks like the best bet. Toussaint struggled with his control in 2018 but has shown enormous strikeout potential in both the majors and minors thanks to a very good curveball. An injury to Mike Foltynewicz makes it very likely he'll start the year in the Major Leagues and I wouldn't bet against him sticking. Toussaint posted a 2.38 ERA in the minor leagues last year yet even with it becoming apparent he has a spot in the rotation, his ADP hasn't cracked to top 300. He's an excellent late round pick with upside. Zach Eflin's career 5.10 ERA may be enough to scare away even the most optimistic Fantasy players. But digging a little deeper shows he made significant improvements in 2018. 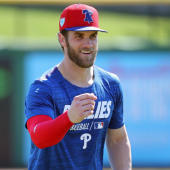 His swinging strike rate went up to 10.3 percent and his average fastball velocity topped 95 miles per hour for the first time in his career. Those two facts alone aren't quite enough, but Eflin has always had very good control and he got a ton ground balls in the minor leagues. Combine that with the increase in velocity and whiffs, and all of a sudden you've got reason for hope. This spring hasn't hurt either, with Eflin stiking out nine batters and allowing three runs in his first 10 innings of work. Unlike Eflin, we've seen what a good season from Steven Souza looks like. And it's far beyond where he's currently being ranked. In 2017 he hit 30 home runs and stole 16 bases playing half of his games in one the worst hitter's parks in baseball. He will hurt you in batting average and his past is checkered with injuries, but Souza heads into 2019 healthy as the likely cleanup hitter for the Diamondbacks. It will be hard for Souza to provide value in a points league because of his strikeouts. Even his career year, he was just the No. 30 outfielder in the format. But in Rotisserie, where you need five outfielders, he's almost free and could be a big help in power, speed and RBI. Marcus Stroman was a top-20 starting pitcher in 2017 and, full disclosure, I didn't buy it. But that doesn't preclude me from thinking he's a great value this year because he's going undrafted in some 12-team leagues. The problems for Stroman in 2018 were numerous. More walks, fewer whiffs, and some rotten luck. It sounds like he attributes a lot of that to shoulder trouble and he's looked great so far this spring with more strikeouts than innings pitched and just one walk in his first 12.1 innings. Stroman will take the ball for the Jays on Opening Day. While I don't believe he has ace upside and don't expect another top-20 season, top-40 seems very reasonable, which would be a large profit at his current cost. Expect good ratios and a lot of innings, even if the strikeout and win numbers aren't overwhelming.